Women who smoke typically begin as teenagers � usually before high school graduation. And the younger a girl is when she starts, the more heavily she is likely to use tobacco as an adult. Teenage girls are just as likely to smoke as are boys. The most recent CDC survey (from 2004) showed that 22% of female high school students and 9% of girls in middle school had smoked at least one cigarette in the past 30 days. How Can Smoking Affect Your Health? 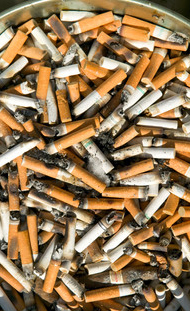 Tobacco use accounts for nearly one third of all cancer deaths. Tens of thousands of women will die this year from lung cancer, which has greatly surpassed breast cancer as the leading cause of cancer death among women. More than 80% of these deaths will be due to smoking. In addition to increasing the risk for lung cancer, smoking is a risk factor for cancers of the cervix, mouth, larynx (voice box), pharynx (throat), esophagus, kidney, bladder, pancreas, and stomach. It's also connected to some forms of leukemia. Environmental tobacco smoke (ETS), also known as secondhand smoke, has been shown to increase the risk of lung cancer. Some studies have also suggested that ETS may be linked to an increased risk of breast cancer. The California Environmental Protection Agency recently concluded that ETS causes breast cancer in younger, mainly premenopausal women. The US Surgeon General is currently reviewing the evidence on this link, and a report is expected in late 2006. Women who smoke greatly increase their risk of heart disease (the leading killer among women) and stroke. Even though most of the women who die of heart disease are past menopause, smoking increases the risk more in younger women than in older women. Some studies suggest that smoking cigarettes dramatically increases the risk of heart disease among younger women who are also taking birth control pills. Smoking is also linked to peripheral vascular disease, a narrowing and hardening of major blood vessels in the body. Smoking damages the airways and small air sacs in the lungs, and is related to chronic coughing and wheezing. About 90% of deaths due to chronic bronchitis and emphysema � collectively known as chronic obstructive pulmonary disease (COPD) � are caused by smoking. The risk increases both with the number of cigarettes smoked each day and with the length of time a woman has been smoking. Female smokers aged 35 or older are almost 13 times more likely to die from emphysema or bronchitis. Smoking "low tar" or "light" cigarettes does not seem to reduce these risks, or any of the other health risks of tobacco. Women who smoke have lower bone density and a higher risk of hip fractures than those who do not smoke. They may also be at higher risk for developing rheumatoid arthritis and cataracts (clouding of the lenses of the eyes). Tobacco use can damage your reproductive health. Smoking is linked to early menopause and a higher risk of infertility. It can also cause complications during pregnancy that can hurt both mother and baby. Smokers have a higher risk of the placenta growing too close to the opening of the uterus. Smokers are also more likely to have premature membrane ruptures and placentas that separate from the uterus too early. Bleeding, premature delivery, and emergency Caesarean section may result from these problems. Smokers are also more likely to have miscarriages and stillbirths. More than 10% of pregnant women smoke throughout their pregnancies. Smoking is linked to an increased risk of preterm delivery and infant death. Research also suggests that infants of mothers who smoke during and after pregnancy are 2 to 3 times more likely to die from sudden infant death syndrome (SIDS) than babies born to nonsmoking mothers. The risk is somewhat less for infants whose mothers stop smoking during pregnancy and resume smoking after delivery. But infants of nonsmoking mothers have the lowest risk of SIDS. As many as 10% of all infant deaths could be prevented if pregnant women did not smoke. Smoking during pregnancy is responsible for 20% or more of cases of low birth weight infants. Smoking during pregnancy slows fetal growth, often causing babies to have health problems as a result of being born underweight. Quitting smoking during pregnancy reduces this risk. Some harmful chemicals in tobacco smoke can also be passed on to a baby through breast milk. Parents' smoking can increase the risk of their children having asthma attacks. Each year between 200,000 and 1 million children with asthma have their condition worsened by exposure to secondhand smoke. Exposing an infant to secondhand smoke also increases the child's risk of pneumonia, bronchitis, and ear infections. .
Parents who smoke are also more likely to have children who smoke. The moment you quit smoking you begin to lower your risk of getting a tobacco-related illness and begin to improve your overall health. But if you need more reasons, we have them! 20 minutes after quitting: Your blood pressure drops to a level close to that before the last cigarette. The temperature of your hands and feet increases to normal. 2 weeks to 3 months after quitting: Your circulation improves and your lung function increases up to 30%. 1 to 9 months after quitting: Coughing, sinus congestion, fatigue, and shortness of breath decrease; cilia (tiny hair like structures that move mucus out of the lungs) regain normal function in the lungs, increasing the ability to handle mucus, clean the lungs, and reduce infection. 10 years after quitting: The lung cancer death rate is about half that of a continuing smoker's. The risk of cancer of the mouth, throat, esophagus, bladder, kidney, and pancreas decrease. 15 years after quitting: The risk of coronary heart disease is that of a nonsmoker's.